An official expansion to the second installment in the action RPG series - Gothic. The add-on expands Piranha Bytes' work by a new story chapter, loosely tied to the events depicted in the original story. This is Gothic II expansion pack. 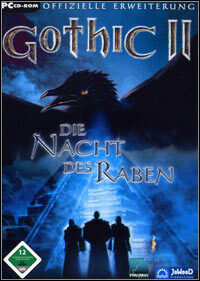 The Night of the Raven is an official expansion to one of the most popular role-playing games of 2002 – Gothic II. In difference to other expansions, which usually adds only new areas or items, the developers from Piranha Bytes went one step further – they added to the basic version a new, large story which is completely unrelated to the main plot of Gothic II. The game world was greatly modified as well (however, it doesn’t mean that the position of key locations on the map changed, they were only expanded and received many additional secrets). This forces the owners of expansion to play the whole game from the start (all saves from the basic Gothic II become useless after installing the expansion). On the other hand, the number of novelties and fixes fully compensates that inconvenience. The Night of the Raven was designed in such a way so that the players would be able to complete the expansion while almost completely ignoring the plot of the basic game. The expansion adds many new locations (jungle, caves etc.) to the basic game, about 100 non-playable characters, unique items (like special amulet inhabited by a fairy that helps in finding valuable equipment), spells, abilities and monsters (such as dangerous bears). During the journey, the player can also meet characters known from first Gothic, who did not appear in part two. The creators of this expansion also improved the game engine (mostly the audio-visual effects) and removed all detected bugs that could be found in the original Gothic II. Game score 8.895 / 10 calculated out of 15670 players' votes.